This is a series that really has me on my toes. What do I mean by that? Well, I am not sure what to expect from it. It can quickly shift from a ridiculous comedy to a romantic drama. Do I latch onto the fact that a dog-like girl is now living with the main character or the fact that there is a silver-haired love interest going through emotional turmoil over her inability to express her true feelings? Regardless, I need more. That is quite the caller ID picture. They definitely addressed the sky girl issue. She is now living with Kanade and that is not going to change anytime soon. The girl acts a lot like a dog, but she eats like a shounen protagonist. What is special about her aside from the fact that she fell from the sky? “Chocolat” as she is called, the lack of an “e” at the end is intentional, was sent to Kanade by God. I am not joking. Apparently, she is supposed to help him lift the curse. How does Kanade go about doing that? By completing missions that are as random as the options given out by the curse. They have a time limit and failing even one will make Kanade’s curse permanent. It sure is too bad that this new God doesn’t know a lot about the curse. If only the last one didn’t have to go on maternity leave due to that pregnancy that resulted from her affair. Once again, I am not making any of this up. The first mission is to make Yukihira laugh from the bottom of her heart or something like that. That is not a simple task when you are dealing with a sadistic comedian. What makes this situation even worse? The episode ends with Yukihira crying on the roof towards the end of the mission deadline. I am starting to enjoy this series more. Is it still ridiculously hard to watch at times due to the choices that Kanade must make? Of course, but that is supposed to be charming I guess. Is the series still ridiculously sexual? I felt like they brought it back a bit this week, but that may just be a relative judgement made based on the ridiculously high level of perversion in the opener. Are we starting to get into some heavy stuff? Yes, and I think that it will be these elements to the story that can push this series over the top. The mental damage that the curse dealt on Douraku is interesting. I don’t think that we necessarily need to dive into that one, but it would be nice to see it mentioned from time to time. What really excites me is this other side of Yukihira. These are probably her true feelings being expressed and I want to see something big happen in the next episode because of it. I would say that Kanade would let her run away in this situation if it wasn’t for the mission. I am curious to see the direction that this series takes from here. I am not saying that it won’t be heavy on the comedy, but we have seen many series change tones from the expected one. She is going to catch a cold is she continues to sleep like that. I would like to talk about the pacing for this series. I know what you are thinking. Well, this is the point that I am trying to make. The opening introduced quite a few characters. We have yet to meet the rest of the reject five, I saw more than two other girls in the opening, and it looks like Kanade has a long road ahead of him. I am worried because the first season only has a total of ten episodes. That means we have eight episodes left and the next one will probably be dedicated to this who Yukihira crying thing and the first mission. I am simply questioning the amount of material that can be given to the fans before a break has to be taken. I may have been spoiled by the fact that a lot of series I enjoy are given twenty-four or more episodes at a time, but ten just seems like a small number to me. 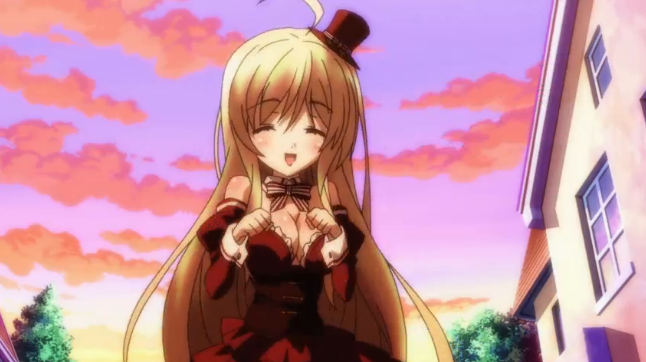 I am still disappointed with what we got from Mondaiji because I really enjoyed that series. Having said that, we got a lot out of Gin no Saji in eleven episodes. We will just have to wait and see. Anime tears are really sparkly.